Ramgerbua Gosavi - a Param Bhakta (Ardent devotee) of Shri Sai Baba - was one of those fortunate souls who were blessed to live in the times of Sai Baba and experience His Saguna Avatar (physical presence). Rageerbua was originaly a resident of Shirdi. His birth must have taken place between the years 1856 and 1860. The house in which he stayed belonged to his maternal grandmother. He grew up in the same house since his childhood. Therefore, throughout his life, he had privilege of being near Sai Baba's physical presence. Ramgeerbua led a Suddha Jeevan. He had no family or children. He lived like a Sannyasi and roamed as he wished. He gathered much information of aspects of Sai Baba's life from the residents of Shirdi and also got information confirmed independently. Ramgerbua shared most of his information with Shri Narashimaha Swami. Thus several facets of Sai Baba's life came to light when Narasimha Swami asked questions on the subject and recorded them. Chandbhai of Dhoopkhed village had himself narrated to Ramgerbua the story of how Sai Baba had helped him in finding his lost mare and how Sai Baba first arrived in Shirdi along with a marriage procession. (This incident is given in the 5th chapter of the sacred text Shri Sai SatCharitra). After making first appearance in Shirdi, Shri Sai Baba disappeared after some time. He then arrived again in Shirdi after a lapse of three years. Bapugeer recounted that according to the villagers, when Sai Baba returned to Shirdi, He had kept His hair long up to His waist. He wore a green Kafni and a saffron colored Topi. He carried in His hand Satka, Chillum and a match box. Readers may recall an incident given in Shri Sai SatCharitra chapter 5, of Sai Baba losing a wrestling bout to one Mohiddin. His nephew used t practice black magic at Belapur. He started performing his mumbo-jumbo in Shirdi against the wishes of Sai Baba. Sai Baba had a fight with the magician and left Shirdi in anger. He started staying in a jungle about two miles away from Shirdi. The villagers used t visit Him there; but He would abuse them and drive them away. Several times, Sai Baba used to spend days without food and water. Sai Baba had started a beautiful garden on the waste land behind the Masjid(where now is the Samadhi Mandir). He used to go to meet Khushalchand Marwadi at Rahata. While returning from there o foot, Sai Baba brought with Him saplings of flowers such as Zendu, Jai, Jui etc. He planted them with His own hands. For watering the garden, Sai Baba used earthen pots, fresh made by Waman Tatya. Once, Gangageer Maharaj of Puntambe had come to Shirdi. He saw Sai Baba watering the plants and said to Nanasaheb Dengle and others who were present, "He is a jewel ! Tough today you see Him watering the plants, He is no common person." Bapugeerbua had herd this incidents from some senior citizens of Shirdi. At that time there was brook near the order of Shirdi and there was Babhol tree, whose one of the branches had got bent towards the ground. It was Sai Baba's practice to sit under this branch. Later on He moved and started sitting under Nimb tree(Gurusthan) in the village. Thereafter He lived permanently in the Masjid till the end. Once, a Muslim boy fell down. Sai Baba at the same time, while sitting in the Masjid shouted loudly, "Are, the thieves will kill that boy ! "At that time Bapugeerbua was with Sai Baba. Sai Baba uttered these words and the news of boy having died came to the Masjid. Once Sai Baba asked Bhagchand Marwadi to immediately run to the bale of of hale that belonged to him. 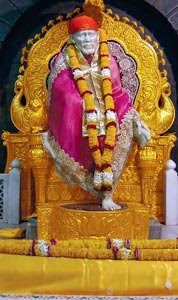 Sai Baba said to him that the bale of hale had caught fire and asked him to run and extinguish the fire soon. After sometime Sai Baba himself also went to the site. made some gestures with His hands and the fire ceased immediately. Other very famous incident that of Jaamner miracle (watch a dramatized video of Jamner Miracle), which took place in 1903-04. Manatai daughter of Nanasaheb Chandorkar was saved from a pregnancy crises by Sai Baba is narrated in detail in Chapter 33 of Shri Sai SatCharitra. Source taken from Shri Saileela Magazine the official periodical of Shree Sai Baba Sansthan Trust (Shirdi). November-December 2007. Anyone can subscribe this magazine which is published every two months form the Sansthan's official web site or Sansthan's office in Shirdi or in Mumbai. Aum Shree Sat Chit Ananda Shree SadGuru SaiNath Maharaj Ki Jai !! !